A table. A woman, a man. In a landscape gradually built before their naked bodies, a past and a present are set under the yoke of their childish maneuvers. Hands move and build small worlds wrapped in an unstable, broad panorama, in disastrous, yet sublime evolution. Gentleness of a giant evokes, in a succession of landscapes in miniature, the constant and paradoxical confrontation between a made-man world and a world that goes beyond man’s orchestrating powers, where the landscape touches the unspeakable, the ineffable, the sublime. 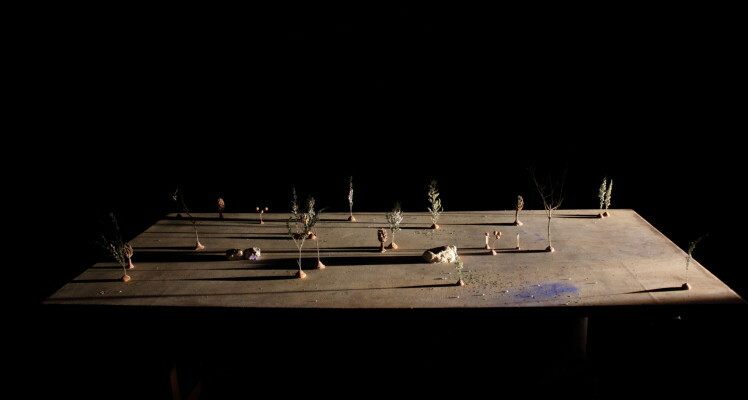 Committed to building and deconstructing worlds witnessed by an audience, Gentleness of a giant puts together on stage two performers and a surface. Under the notion of landscape as a process, as an activity, as a kind of verb, the piece flirts with the curious and subtle power that the landscape exerts on us, using a common resource for architects and engineers: the creation of landscapes in miniature on the surface of an architect’s table. With the same strategy, but without disconnecting from the dimension of the live experience, the bodies of a man and a woman move and are at the same time figure and background, giant bodies that mirror themselves in what they build. As temporary owners of a territory where they manipulate materials that give rise to mountains, valleys, rivers, plains in a panorama under the dangers of the path, of the accident. Aristotle called endekhomenon, the place of the accident and the possible, the reality where we deliberate and which we transform. With this spirit in mind, Gentleness of a giant meets the place of the accident, the unexpected in the course of a landscape, which opens to new sensations, new shapes and reinterpretation of what is being experienced here and now. The performers become thus creators of worlds and at the same time, when provoking their own deviations, our common possible endangered futures. Ciríaco continues to draw the contours of his surroundings, to think the individual, the act of living, the conviviality, the other, except that now he expands this perception to the whole, to the world, to stories, to that is urgent. He is another artist, still being himself. Or maybe that’s just a second parcel of his. His own continuation. His being himself and altogether new when continuing. What there is no doubt about is that this diptych is one of the most interesting shows at this Biennial, for how the artist reinvents himself and for the dilemmas that he points at to the human being without having to make minor opportunistic speeches. His poetry overcomes the need of any speech. It becomes art. Nature as it isn’t. Or that we assume as nature, more and more truly becomes fiction. 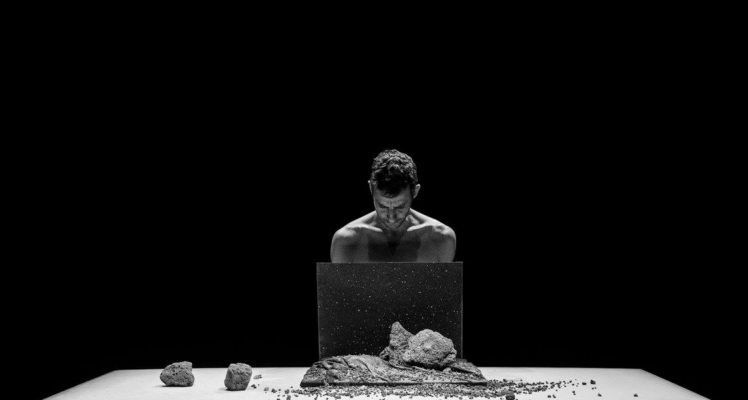 This vibration that (Gustavo Ciriaco) connects to the ground materializes now in an overwhelming piece of beauty and desolation. The “Gentleness” and “Giant” are ironies full of ambiguities. Here he plays with the fragile, yet also strong, impact each person has on nature, the horror and the sublime. It is live poetry between the sublime and the threat of a planet under destruction. This project is part of a trilogy involving each time a different couple and format: a theatre; a gallery, a cinema. The second part of the trilogy Gentleness of a giant | Trip to a wrinkled plain was in residency at Centro Cultural España, under the frame of PAR- Artistas en Residencia in April and was presented under the Festival Internacional de Danza Contemporanea de Uruguay-FIDCU. May 4th & 6th. Montevideo. The performance was later performed at Festival Atos de Fala, Instituto Oi Futuro Ipanema, May 2016. Rio de Janeiro. The project attended residency at Festival Arquelogías del Futuro, Buenos Aires, Dec. 2016 and at Bienal SESC de Dança, where it was premiered on September 15th, 2017. Bienal SESC de Dança, Campinas, Brazil. September 16th, 2017. Gentleness of a giant, Walk & Talk – Urban Art Festival, extension to Terceira Island, Azores. September 24th, 2016. The Museum as Performance, Museu Serralves, Porto. September 18th, 2016. Festival TODOS, Lisbon. September 9th, 2016. Teatro Micaelense, in the frame of Walk & Talk Azores – Public Art Festival. June 2nd, 2016. Ponta Delgada, Azorean Islands. Espaço NEGÓCIO / ZDB, première. March 30th & 31st, Feb 1st & 2nd, 2016. Lisbon. PREMIÈRE. Espaço do Tempo. March 7th-13th, 2016. Montemor-o-Novo. Arquipélago – Centro de Artes Contemporâneas. February 29th – March 6th, 2016. Ribeira Grande, Azorean Islands. Largo Residências. Nov 31st- Dec 17th, 2015. Lisbon. DRIFT 2015, with public showing of the process at Espaço Gargarulho. July 2015. Miguel Pereira, Brazil. Théâtre de la Tête Noire, Saran, France. Feb 1st, 2nd et 3rd, 2018. Festival Verão Azul, Lagos, Portugal. October 2019. Photos by Dina Salem Levy, Fernando Resendes, Natália Viroga e Vera Marmelo.